Wedding Florists Tampa Bay – Meet Jacyln & Catherine at Marigold Flower Co.
Hello there! We're Catherine and Jaclyn, co-founders of Marigold Flower Co. We believe getting to know the people behind the brand is just as important as knowing the brand itself. So, we wanted to share a little about ourselves, and hopefully we'll get to learn a bit about you too! We have been best friends since birth and have always dreamed of working together. While our business ideas have changed over the years, we found our niche when Jaclyn married into a flower family. We gained experience working at one of Tampa's premiere flower shops, Carrollwood Florist (owned and operated by Jaclyn's in-laws), where our passion for weddings was cultivated. After three years of honing our craft and growing a once modest wedding department, we decided to take it to the next level. 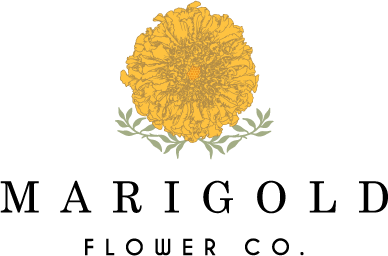 We created a separate brand for our brides to fall in love with --- and thus, Marigold Flower Co. was born.